On Saturday, April 22nd, Village of Mamaroneck Mayor, Norman Rosenblum officially announced his candidacy for Westchester County Legislator at a press conference which was held outside of the Village Court. Rosenblum, who is a Republican will be running against Democrat incumbent, Catherine Parker. Ms. Parker accepted the challenge and stated that residents would be “fortunate to have the choice of two elected officials with records of accomplishment in environmental matters”. As for budget issues, she said “there would be a clear choice and voters do not need to add another member to the Republican caucus that will continue to rubber stamp policies that are out of sync with the values of Westchester residents, particularly those in District 7”. In other news, Mayor Rosenblum said that Mamaroneck’s immigration policy has not changed and assured undocumented residents that they will not be asked for their immigration status by Village Police. The Mamaroneck School Board adopted a $135 million budget for 2017-2018 unanimously. The budget will hike spending 1/46% and increase the tax levy by 2.25%, which is significantly over the 1.04% state tax cap. This marks the first time that the school district has chosen to override the state tax cap since it was adopted in 2011. One of the aims of the budget is to address an enrollment account of about 8% in the last six years. It contains staff cuts, including those in the APPLE program which is a point of contention with some resident parents. APPLE teachers and students will be absorbed into mainstream classes. Superintendent Dr. Robert Shaps said that students who need support will still have access to a psychologist and an academic liaison. There will be a budget hearing on Tuesday, May 2nd, and the public vote will be on Tuesday, May 16th. Due to the budget overriding the state tax cap, it needs a majority vote of at least 60% percent to pass. Niche.com, a website designed to help people learn more about their neighborhoods and communities nationwide by using data and reviews recently ranked the Mamaroneck and Rye Neck School districts in the top fifty of the best public high schools in New York State. Rye Neck earned a ranking of thirty-two and Mamaroneck was ranked at forty-four. Thirty-seven schools in the Hudson Valley made the 2017 list which had researched a hundred schools in the state. The Westchester Science and Engineering Fair was recently held and twelve Mamaroneck High School students were rewarded for their work in areas such as animal sciences, medicine and health. Ali Mann, a junior who was chosen along with twelve other students to compete as a finalist in the Intel International Science and Engineering Fair that will be held in May. The students are from the original Science Research Program, which is an elective that begins in ninth grade and includes regular classes as well as two summers of independent research with mentors. Village of Larchmont Mayor, Lorraine Walsh, who is a former science teacher and scientist, acknowledged the students along with their teacher, Guido Garbarino at the Village Board meeting on Monday, on April 17th. On Monday, April 24th, there will be a public hearing on the Village of Larchmont’s proposed budget. Village Administrator Justin Datino said budget will be worked on until the very end. Mayor Walsh said that the board would like to have a final discussion with the finance and budget committee before the final vote. The new property tax would increase by 3.96%. This would be a somewhat smaller increase from last year, mostly due to a result of increases in revenue and decreases in expenditures in police personnel services. The final budget must pass by May 1st. The Village Board also set public hearings for May 15th on local laws regarding off-street parking, explosives and blasting and sidewalk cafes. The Sheldrake Environmental Center hosted an Earth Day Celebration on Saturday, April 22nd. The event included a reservoir clean up. For more information on this event as well as future events, go to www.sheldrakecenter.org. Eyewitness News Anchor, Bill Ritter, recently interviewed two local religious leaders regarding the overlapping of Easter and Passover. Reverend Bill Crawford from the Larchmont Avenue Church and Rabbi Jeff Sirkman from the Larchmont Temple, gave positive outlooks on both the country and planet and also discussed how much we all have in common. They are hosts of LMCTV’s Faith and Eggs. Rabbi Sirkman called the show a wonderful opportunity to build bridges of understanding. He added, “when we can learn to appreciate our distinct perspectives and divergent religious paths, we uphold the dignity of difference; knowing we need one another to create a world that is truly one”. In our Round Table discussion, Maura Carlin spoke with Dr. Barbara Ferraro, Rye Neck School District Superintendent and Dr. Kimberly Bucci, Rye Neck School District Assistant Superintendent for Business and Finance about the school budget and other school related topics. In our LMC Sports Play of the Week, the Mamaroneck High School baseball team played White Plains in their home opener. With the scored tied at one, Mamaroneck center fielder saved the the score with a diving catch. Local Live reporter spoke with Laura Saravia Bott, owner of the Bott Shoppe on Mamaroneck Avenue about the upcoming Food Truck and Makers Festival that will be held on Sunday, April 30th from 12-5. The event will be on Fayette Avenue between Fenimore Road and Ogden Avenue. There will be food from various food trucks including Walter’s Hot Dogs as well as art exhibits and face painting for kids. LMCTV’s Annual Awards Night is coming up on Wednesday, May 24th and nominees were recently announced. The Local Live would like to congratulate all the nominees. Starting May 1st, you can vote for your favorite varsity sports play of the year at facebook.com/lmctvon. The Awards Night celebration will be held at VFW Post 1156 on Boston Post Road in Larchmont at 7:00 p.m.
Our Pets of the Week are Leo, a very shy but lovable five-year-old cat who gets along with other cats, people and gentle children and loves to cuddle in your lap; and Lacey, a shy Shepherd mix who is just under a year old. She weighs forty-five pounds. She will melt your heart. She loves to play. For more information on both Leo and Lacey, as well as other pets, to to www.ny-petrescue.org. After reports from news sources that the Village of Larchmont and the Town of Mamaroneck were having trouble with undelivered mail, the US Postal Service will conduct an internal review. In an exclusive interview with The Local Live, Debra Jones, the Westchester District Marketing Manager for the Postal Service, could not either confirm or deny that there was a problem with the Larchmont mail service, but did state that there is an ongoing review due to the claims that were made. The deadline to file tax returns is Tuesday, April 18th, due to the fact that April 15th fell on a Saturday this year, and Emancipation Day, which is celebrated in Washington, D.C. The holiday usually falls on the sixteenth but that date was Sunday this year. The School Board will vote on the superintendent’s proposed budget on Tuesday, April 18th and the community will get a chance to vote on May 16th. Lisa Zeitoun told The Local Live, “we are hoping for Dr. Shaps to change his mind. If need be, we will ask the community to vote “no” unless the APPLE program is spared. MHS Graduate and film producer, Fred Berger will be the guest of honor at a screening of La La Land. There will also be a question and answer session. The event, which will be Wednesday, April 19th at the Beach Point Yacht Club, is being sponsored by the local alumni group of his alma mater, the University of Pennsylvania. For more information, go to penn-club-westrock.org. The green room of LMCTV’s Studio Two recently got a mini makeover during the weekend of April 8th and 9th, courtesy of Jamie Lynn Wesinger, the owner of MADE: My Art and Design Experience. She created a beautiful mural for the wall and spoke with The Local Live about her inspiration for the design. Our Round Table discussion focuses on Autism Awareness Month. Hosts Maura Carlin and Mike Witsch spoke with Linda Banta, Special Needs Director of Backyard Sports Cares and Marjorie Madfis, President and Founder of Yes She Can, Inc., about the challenges facing autistic children and adults. The Local Live welcomes Kate and Kayode Howard, the hosts of Scriptly Adapted, LMCTV’s movie review show. They will provide monthly reviews in our new segment, Scripted Live. Our Pets of the Week are Scarlett, a good-natured tabby who likes playing with other cats and likes to sit by the window, and Mikey, a handsome one year old Lab-Pitbull mix with a playful personality. He loves people, most dogs and even cats. For more information on them and other pets, go to ny-petrescue.org. If you like our show and want to help keep us on the air, please go to our website, www.lmctv.org and click on DONATE button. We appreciate any donation. 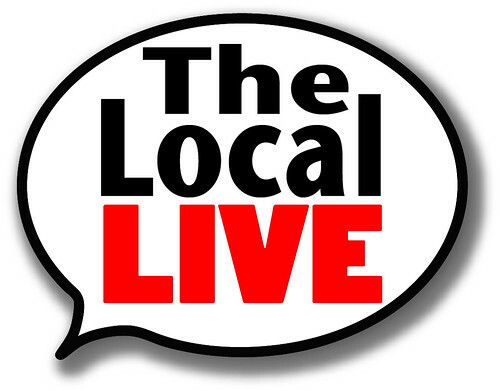 The Local Live is always looking for new volunteers and interns, so send your emails to thelocallie@lmctv.org. We love hearing from you. This week, New York State Senator, George Latimer, who is a democrat from Rye, announced that he will run for Westchester County Executive. Latimer, who was raised in Mount Vernon, has represented the Larchmont-Mamaroneck area since 1991, when he was a legislator for Westchester County. He has served as chair of the legislature, as a New York State Assemblyman and is currently in his third term as State Senator. He told The Local Live, “people in Larchmont and Mamaroneck have seen me at work for a long period of time. They know my dedication to doing a good job. My challenge is reaching out all across this vast county and make the case to people who don’t know me as well and that’s exactly what I intend to do”. Incumbent County Executive, Rob Astorino, who is a Republican, is expected to run for a third term on the strength of his zero-increase budgeting. Latimer will be going after Astorino for over-reliance on borrowing and for overturning a ban on gun shows at the County Center, as well as other policies that Latimer called “closer to Trumpism” and “the most conservative county administration we’ve ever had”. Other democrats who are also running are Ken Jenkins, a four-term County Legislator from Yonkers who declared his candidacy this past August and David Spano, who is the son of former County Executive Andy Spano, announced his interest to run this week. Assemblyman Thomas Abinanti from Mount Pleasant is still considering a run for the position. The discussion regarding the Mamaroneck School Budget continued Tuesday, April 4th focused on the PACE 4 music class. The class is one part of the four-year elective in music, dance and theater at MHS. The program was slated to be cut, but for now, PACE4 Music is safe, most likely due to an online petition to save it. Board President, Melany Gray stated at the outset that the PACE program itself was not being eliminated. Mamaroneck School Superintendent, Dr. Robert Shaps has called the PACE program, “a hallmark program of the school system” and said that the consideration of cutting the fourth year music class was on historical enrollment data. Even before any public comments were made, Dr. Shaps recommended that juniors select electives including PACE 4 Music and that the administration will reevaluate the interest in the class once all the data is available. Sixteen MHS students and two parents spoke about the significance of providing high level music education for those students are committed to being musical artists. Other topics reviewed included initiatives for a healthier lunch program and the APPLE program, which was the focus of our last two Round Table discussions. The Mamaroneck-Larchmont Student Aid Fund is celebrating its 80th birthday this year. The program has helped local students pay for college and they hope to continue supporting the community for many years to come. Past presidents of the organization blew out eighty candles on a birthday cake and were then honored with a champagne toast. Claudia Huter, who is the owner of the Larchmont Music Academy and LMCTV Volunteer, Kevin Duarte spoke about how the Student Aid Fund helped them with making their college dreams a reality. At their meeting on Monday, April 3rd, the Village of Larchmont Board of Trustees swore in three officials. Malcolm Frouman who was re-elected to his first full-term, said that he is happy to have the opportunity to serve another two years in the village he loves. Carol Casazza Herman who was elected to her first Trustee tern, said that she is ready to face challenges, such as budget constraints and the need for new revenue. Village Justice, Thea Beaver who was re-elected for a fifth term, said that the Village Court has been busier than usual with cases on several different subject matters. In other Larchmont news, the Village announced that there will not be a drive-thru Dunkin Donuts near the train station. A proposal had been made to make the former Bank of America drive-thru on Palmer Avenue into a Dunkin Donuts drive-thru. The Building Department rescinded the application due to Dunkin Donuts representatives not being present at Planning Board meetings going back to December. Local residents debated over the issue on social media. Residents who opposed the idea, complained about pollution from idling vehicles, an increase in litter, harm to the Village atmosphere, the fact that there are too many coffee shops in the area as well as the possibility of traffic jams. Those who were in favor of the idea stated that a traffic study found minimal impact and that a drive-thru would benefit parents with young children as well as commuters. “We want a drive-thru Dunkin Donuts in Larchmont”, a group started on Facebook has generated over a hundred likes. An article in the The Daily Voice reported that residents “rally” for the drive-thru. There is support to fill empty stores and to bring in needed tax revenue. Some residents disagree with the article. Michael Divney, Jr. said that “they are disingenuous at best and most likely disguised paid ads by the franchisee”. Vincent Pastore, who starred in The Sopranos, recently visited LMCTV’s Studio Two as a guest on Alan Bendich’s talk show, The Way to Go. Pastore talked about his Westchester roots, his road to success and his band, The Gangster Squad. The band will be playing on May 13th at the Knights of Columbus in Port Chester. To watch the full interview, go to www.lmctv.org. The Mini STEM-tastic “Choose Your Challenge Night” was recently held at Hommocks Middle School. LMCTV was one of the participants. Hundreds of students took part in the event. The event was hosted by the STEM Alliance of Larchmont-Mamaroneck. Students tried their on-air skills with our Local Live trivia question. In the next few weeks, we’ll be highlighting the very talented junior reporters. In local sports action, the Mamaroneck Softball team started their season with an impressive 16-0 victory over Ardsley High School. Did you know that Mamaroneck has its own distillery? The Good Shepherd Distillery brews brandy and vodka with sources from all over New York State. Local Live Reporter, Michael Bianco went to the distillery to learn more. Local Live anchor, Alexandria Garcia spoke with Village of Mamaroneck Recreation Leader, Elizabeth Linsalato about the Staycation Camp at Harbor Island Park. This week, we feature two pets who are available for adoption. Jerry, who is a brown tabby and is around five years old, is up to date on his shots. He loves taking cat naps and would be a great asset to a loving family. Tootie is a German Shepherd Mix who is about six years old and weighs sixty pounds. She is friendly and sweet with other dogs and humans. She’s a favorite with Pet Rescue dog walkers and neighbors. For more information, go to www.ny-petrescue.org. If you like our show and want to help keep us on the air, go to our website, www.lmctv.org and click on the DONATE button. We appreciate any donations. The Local Live is always looking for new volunteers and interns. So send your emails to thelocallive@lmctv.org. We love hearing from you. After experiencing problems with her mail delivery, Larchmont resident Adrienne Weiss-Harrison posted her complaint on the Love Larchmont Facebook page and found that she wasn’t the only resident experiencing problems. Over one hundred residents responded, which led to reactions from the post office, political leaders, CBS News, The Journal News as well as other online outlets. Complaints were listed as missing letters, lost packages, mail left at the neighbors and days without any delivery at all that have lasted for years. One resident, Eleanor Sherman, the sporadic delivery service was a major concern due to her home business on Murray Avenue. Village of Larchmont Mayor, Lorraine Walsh sent the complaints to State Senator George Latimer, U.S. Congressman Eliot Engel and U.S. Senator Kirsten Gillibrand. A spokesperson for the US Postal service told The Journal News that they were conducting a “top to bottom review” of the operations in the area to meet customers’ expectations. If you’re a Larchmont resident and have any further concerns about your mail delivery, you can call the Larchmont Post Office at 834-4963 or the Westchester District Consumer and Industry Contact Office at 697-7000 extension zero. The Village of Mamaroneck has found a new Village Manager to replace Richard Slingerland. Robert Yamuder, who will start in May, is actually returning to the Village of Mamaroneck. He had previously served as the Assistant Village Manager from 2002 to 2009, before leaving Mamaroneck to serve as the Pelham Village Administrator and Treasurer. He stated that he can’t to get started in his new position. While passing a major milestone, the Flood Mitigation Plan that was proposed for the Mamaroneck and Sheldrake Rivers, still has a long way to go. A contingent of local officials was in Washington, D.C. recently when the plan was approved by the Army Corps of Engineers Civil Works Board which included top level engineers, staffers and scientists. Village of Mamaroneck Mayor, Norman Rosenblum, Village Trustees Leon Potok and Victor Tafur, Village Manager Richard Slingerland, Flood Committee Chairman Tony Gelber, Flood Committee Member Andrew Spatz and Planning Board Member John Verni attended the meeting. The plan will now go to state and agency review. A final study and report is expected to be signed by this summer. After that the process can begin at the federal, state, county and village levels to secure funding, which could take a few years. The mayor does not expect construction to begin until 2020. To help honor World Autism Awareness Day on April 2nd, the New Rochelle Police Department issued an Autism patch challenge. Their goal is to have awareness patches on every police vehicle across the country for the month of April. In our area, the police and fire departments as well as ambulances in both Larchmont and Mamaroneck will be displaying the patches. The Larchmont Fire Volunteer Fire Department posted on Facebook “be on the lookout for these amazing patches”. LMCTV Chief Operation Officer, Matt Sullivan joined others in Albany to propose a bill that would guarantee future funding for public access stations in New York State. In our Round Table discussion, Mike Witsch spoke with Lisa Zeitoun and Katrida Reda, parents of APPLE students and Romina (Romi) Chavez, current APPLE student and Travis Danoski, APPLE alumnus to talk about their concerns and oppositions for the redesigning of the APPLE program at Mamaroneck High School. “Brave the Shave” fundraiser in which participants shaved their heads to help defeat childhood cancer. Local Live reporter, Xavier Campo was there to file a report. This week’s In The Spotlight features Sugar Mama by Kim Bakeshop in Larchmont. The local bakery features custom cookies, cakes and desserts for all types of occasions. Local Live anchor, Alexandria Garcia interviewed the owner, Kimberly Conca. Alexandria even got a chance to help decorate a cake. This week. There are two adorable pets in our Pet of the Week segment. Sherry is a beautiful two year old Tuxedo Cat who loves to be brushed. She is a purring machine and she loves curling up in your lap. Roscoe is a handsome Cattle Dog mix who is about four years old. He loves taking long walks and he would prefer to be the only dog in the house. For more information on both Sherry and Roscoe as well as other pets, go to http://www.ny-petrescue.org. The Local Live is always looking for new interns and volunteers, so please send your emails to thelocallive@lmctv.org. We love hearing from you.